Here are some facts about Paul Klee, the famous painter. 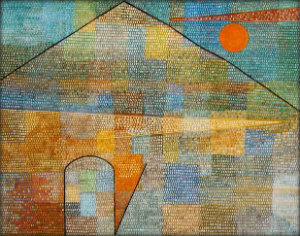 Paul Klee was born on 18th December 1879 in Muchenbuchsee bei Bern, Switzerland. His father was a German music teacher and his mother was a Swiss singer. As a young boy he started to follow in his parent’s footsteps and train as a musician, but by the time he was a teenager, he became inspired by visual art. In 1898, Klee studied at the Academy of Fine Arts in Munich. He then went to Italy, visiting Rome, Florence and Naples. In 1911 Paul Klee became friends with Wassily Kandinsky, and in 1912 Klee travelled to Paris and was inspired by Cubism and Robert Delaunay’s brave use of colour. 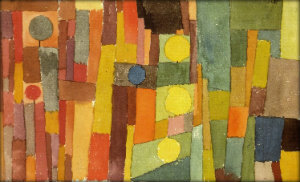 Klee started to experiment with colour and define his own style. Klee’s first abstract painting was In the Style of Kairouan. His style doesn’t fall into just one artistic movement. He borrows from Cubism, Surrealism and Expressionism. Paul Klee was involved in World War 1, but he never served on the front line. He continued to paint abstract art during the war and was gaining popularity. Klee taught art at the Bauhaus school in Germany but he was forced to leave by the Nazi party after his house was searched by the Gestapo. He produced the work Ad Parnassum in 1932, one of his most well-known paintings. In 1933 he completed more than 500 pieces of work, and in 1939, he completed 1200. He finished more than 9000 pieces of art in his lifetime. In the latter years of his life, Klee suffered from scleroderma, a wasting disease. He died on 29th June 1940. He is buried at Schlosshaldenfriedhof in Switzerland. Thanks, Tmeciah. Glad you found Primary Facts easy to use. Please visit us again soon! helped alot project is finished. Brilliant helped alot with my at homework. Thank you! This really helped me. Thanks!